Maggie Muggins Designs: Confession #1 - I have no organization system. Confession #1 - I have no organization system. I like too many crafts. You name it, I have probably done it, or want to. While to many this may not seem like a big problem it really is. I have so many projects waiting for me to get around to them. If only it were just the sewing projects, but alas, it's the decor, the scrapbooks, the furniture, the artwork, and oh so much more. My craft closet has exploded and has taken over the entire guest room, part of the kitchen, and hides in my personal closet, the garage, and yet other locations throughout the house. Shhh - don't let my husband know how bad it really is or I'll never hear the end of it. Anyhow - I saw this closet system and it had me drooling. That's about the size of my craft closet. But then I realized I have too many large items, tons of fabric, paper, supplies, a sewing machine and a serger and a whole lot more. Organizing it all into that little space would be next to impossible. I'm not kidding. No wonder it's all over the house. 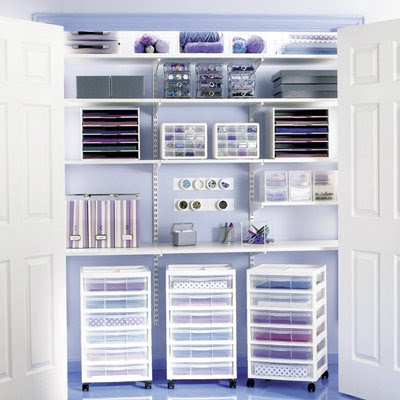 That and with all my stuff put away, even with the beautiful closet system - it would NEVER look this good. Someday maybe I'll have my own craft room. Imagine that - just walk in, sit at the table and start back up on the current project? No clearing off the table just in time to eat, no hauling everything back out of the closet just in time to have to put it all back. Apparently other people have that luxury. I curse them, and secretly envy them. I too envy those people with the large craft rooms. I wish I didn't have to unload all my craft supplies just to put away again and not be finished.